Discover the new programme for the 2019 festival, from 27th April to 1st June with 10 original musical performances, hosted by the festival’s partners, in the most beautiful venues across the Aspre valley. 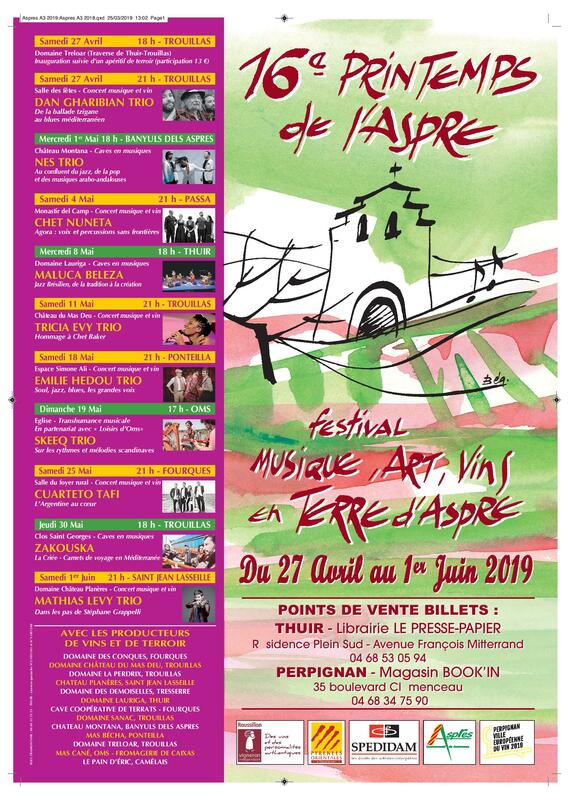 Accompanied by local wine growers and regional producers, the Printemps de l’Aspre 2019 is a unique musical adventure. Take part in exceptional artistic encounters with up-and-coming performers as well as established favourites in duet, trio, quartet and quintet formations. Music and songs, between tradition and modernity, surfing between jazz, soul and pop… Travel from east to west, with some stops in Mediterranean ports and an escape to Scandinavia. Enjoy jazz in all its forms, world music, songs of exiles and migrations. Meander between joy, nostalgia, dreams and hopes. Printemps de l’Aspre is bursting with surprises so book your places now!